Hanging man is the name of a bearish trend reversal pattern, which forms at the top of an uptrend. The Japanese gave this name because it looks like a head with the feet dangling down. It is a single candlestick pattern that has a long lower shadow and a small body. The color of the body is not important. The lower shadow of this candlestick is at least twice as long as the body. There is no or hardly any upper shadow. Another important criteria is that the top of the candlestick’s body should be above the two previous white candlesticks. 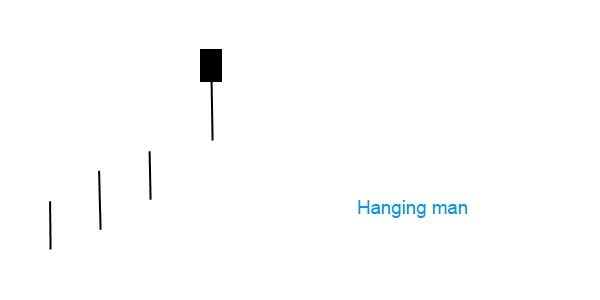 The hanging man is considered one of the 12 major signals. It signifies a market top or a resistance level. A very similar candlestick pattern is the hammer, which actually looks the same. What makes the difference between hanging man and hammer then? Both candlesticks have long lower shadows and small bodies. What distinguishes the two is the nature of the trend that they appear in. A hammer forms in a downtrend and thus is a bullish reversal pattern, while the hanging man appears at the top of an uptrend.